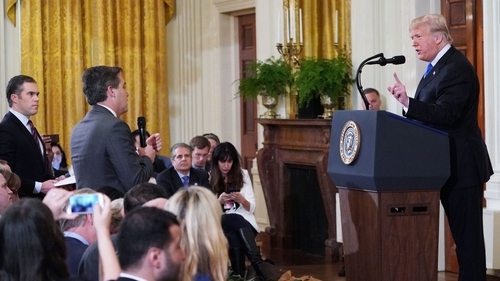 The White House has suspended the press pass of a CNN reporter who earlier sparred with US President Donald Trump at a news conference, in which the president branded the journalist an "enemy of the people". A visibly angry Mr Trump had called reporter Jim Acosta a "rude, terrible person," after CNN's Chief White House correspondent refused the president's orders to sit down and give up the microphone during the news conference one day after the US midterm vote. "The White House is suspending the hard pass of the reporter involved until further notice," said White House spokeswoman Sarah Sanders hours later, referring to Mr Acosta, who then tweeted that he had been denied White House entry. The heated exchange began after the prominent journalist clung to the microphone and persisted with questions about the president's views on a caravan of Central American migrants making its way to the US border. Mr Trump said "that's enough" and a White House intern unsuccessfully tried to take the microphone from the CNN journalist. "President Trump believes in a free press and expects and welcomes tough questions of him and his Administration," Ms Sanders said in her statement. Ms Sanders said on Twitter: "We stand by our decision to revoke this individual’s hard pass. We will not tolerate the inappropriate behaviour clearly documented in this video. "We will, however, never tolerate a reporter placing his hands on a young woman just trying to do her job as a White House intern. This conduct is absolutely unacceptable." Mr Acosta shot back at the accusation of misconduct, tweeting "this is a lie", as his network and a number of Washington journalists who had been at the press conference voiced support for him. "Secretary Sanders lied," CNN said in a statement, saying the press pass suspension was "done in retaliation for challenging questions". Ms Sanders "provided fraudulent accusations and cited an incident that never happened," the US cable network said. "This unprecedented decision is a threat to our democracy and the country deserves better. Jim Acosta has our full support." An association representing the Washington press corps urged the White House to "immediately reverse this weak and misguided action". "The White House Correspondents' Association strongly objects to the Trump Administration's decision to use US Secret Service security credentials as a tool to punish a reporter with whom it has a difficult relationship," the group said. "Revoking access to the White House complex is a reaction out of line to the purported offence and is unacceptable." It was the latest in a long history of fiery run-ins between Mr Trump and Mr Acosta. At the news conference, Mr Trump, when asked if he had "demonised immigrants" during the midterms campaign, replied: "No, I want them to come into the country. But they have to come in legally." Mr Acosta persisted, saying: "They are hundreds of miles away. That is not an invasion." "Honestly, I think you should let me run the country. You run CNN, and if you did it well, your ratings would be higher," Mr Trump said. As the reporter continued, President Trump declared: "That's enough, put down the mic" and walked away from his own podium, as if leaving. The intern attempted to take the microphone from Acosta, who nevertheless tried to shout out one last question. Waving his finger, Mr Trump berated him. "I'll tell you what, CNN should be ashamed of itself having you working for them. You are a rude, terrible person. You shouldn't be working for CNN," he said. When NBC reporter Peter Alexander took the microphone for the next question, he defended Mr Acosta as a "diligent reporter" - earning Mr Trump's ire. "I'm not a fan of yours either. To be honest. You aren't the best," he said. Looking back at Mr Acosta, who again rose up in his own defence, President Trump added: "When you report fake news, which CNN does a lot, you are the enemy of the people." In response, CNN said: "This president's ongoing attacks on the press have gone too far. "They are not only dangerous, they are disturbingly un-American."